Posted by littlelc on Tuesday, January 6, 2015 in Courses. Catalog Description: Jewish and non-Jewish literary and historical texts studied in parallel so as to discover the differences between them. The course will consider texts from the ancient world to the early modern period and ask what constitutes Jewish writing and how it has been defined through time and geography. All readings will be in English. 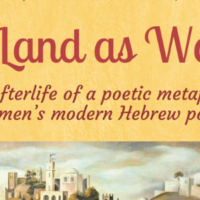 From the Syllabus: What is Jewish about a Jewish text? Does it remain constant over time? Can we define a Jewish text as against a non-Jewish text? What does this sort of question tell us about the character of being Jewish, of Jewishness, culturally and in other ways? Does language or subject tell us? Readership? How can we know? We shall look closely at a variety of texts, Jewish and non-Jewish. This course demands much reading and active participation in class discussion and writing. The texts will go from the ancient through the early modern period, each one generally paired with a related type of non-Jewish text. The distant ancestor of this is in a sense Auerbach’s Mimesis, though this is intended more as a historical than a literary exercise.